Today the game has an update with a few interesting changes. Now you can meet bots in all rating battles. They can be identified by the banana paint and the avatar of Captain Crab, who directs them. If you kill the banana guard with the number 1 and capture it in the screenshot, you can get for the fight X-crystals. Now, instead of supply boxes in the battles, you will see Gold boxes. All players without a premium account now have a nickname Bot, all players with a premium account — King. New sounds were added to the game. April 3 morning, all the bots will gonna be bananas. Drone Turret — cooldown reduced from 46 to 40 seconds, duration increased from 16.5 to 18 seconds. Force field — duration reduced from 13.5 to 12 seconds. Increased damage — cooldown increased from 33 seconds to 40 seconds. Invulnerability — duration increased from 2.5 to 3 seconds. Spider Mine — cooldown increased from 54 to 60 seconds, max damage reduced from 1800 to 1500. Firebird — increased damage from 517 to 546. Freeze — increased damage from 483 to 506. Isida — reduced damage from 452 to 448, self-healing reduced from 36 to 29. Double experience promotion is valid until 21:00 UCT April 2. 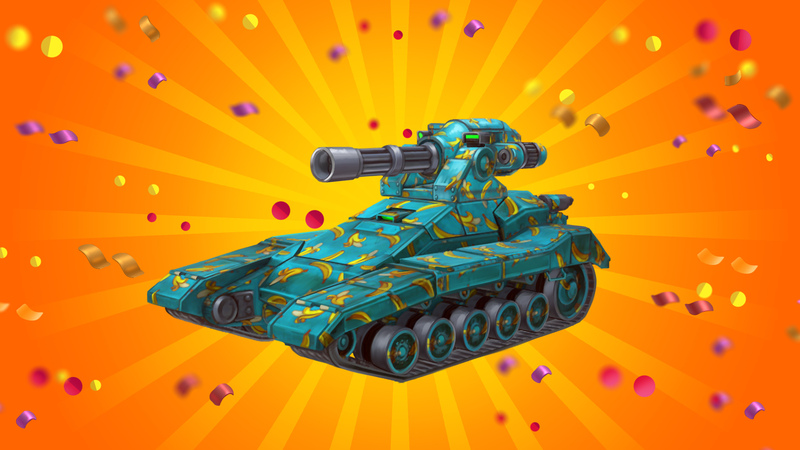 You will get the legendary ammunition “Papercracker” for the Hammer with X-crystals purchase with the second package or bigger. Epic ammunition “Cannonball” for the “Ricochet” is on sale for 549 X-crystals. Avatar “Captain Crab” is on sale for 199 X-crystals. Allows you to control bots in your battle. Paint “Banana” is on sale for 249 X-crystals. Become a banana!